Recently I've changed my tune and I'm hoping to change yours too. This recipe, start to finish, takes no more time, is a lot healthier, and way yummier for mom's and kiddo's alike. You will have to dirty one additional pot, and grate your own cheese. But these simple steps, I promise not more time consuming, will be sooooo worth it! 2. 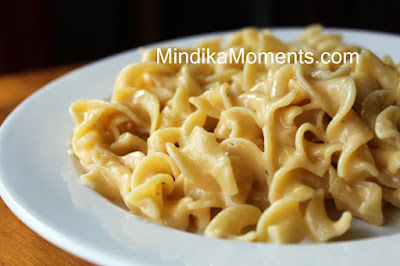 While the pasta is cooking make the cheese sauce by melting the butter in a sauce pan over medium-high heat. Add the flour to form a rough (paste). 3. Allow the rough to cook for a couple minutes, then add the chicken stock and milk while whisking. Bring to a boil whisking until the sauce reaches a gravy consistency. 5. Season with salt & pepper to taste. 6. Toss the cheese sauce with the pasta and serve immediately. *You can use any melty cheese you like or even combine cheese for additional flavors. Reese loves the plain cheddar, but when I make this for our family I often use cheddar and Parmesan, or Italian cheese blend. **As an additional side note, this dish can easily become a meal by adding 1 lb. ground beef, chicken, or even ham. Mine didn't really turn into a sauce the cheese clumped together. Did I do something wrong? Had the sauce formed before you started adding the cheese? You want to make sure you've got a good sauce before you start adding the cheese, then add the cheese in small amounts, allowing the cheese to slowly melt into the sauce; about 1/2 cup at a time. Depending on the kind of cheese you're using, you may need more or less cheese. I hope that helps. I am trying this one tonight for dinner with my kiddos while the hubby is in Okinawa. How is the pregnancy going? Beside the fact that I had to run Logan to the ER and so I didn't get to enjoy it right away, it was wonderful when warmed up. I am no longer buying the box. My boys loved it too. Heather, the pregnancy is going well. I'll be 20 weeks in a few days and we get to find out what we're having a week from today. I'm very excited! I'm so glad you liked the recipe, but I'm sorry you spent the night at the ER, especially with your husband out of town. I hope Logan is ok? Yum! This recipe looks really simple and uncomplicated (I love that!) and who doesn't love mac and cheese? I'm booking this one to try! This is a classic my mom used to make me as a kid.. although she would bake it afterward... this is my all time favorite food! Going to have to whip this up tonight! is the 1/2 lb of pasta measured out before being cooked or after? I wanted to make this today so I might just experiment. Thanks.